Away from these sensational new machines, the print-and-cut devices for which Roland is better known, held their own. The ever-popular BN-20 (a machine so beloved it has its own user group on Facebook) packed a powerful punch with its combination of high print quality and compact size. For those who wanted to plan ahead for greater growth in their business, the TrueVIS SG-300 gave an example of an entry-level wide-format printer. 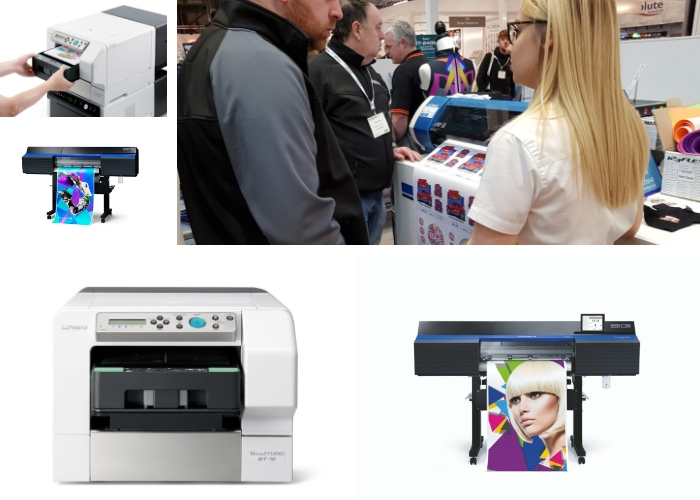 Alex Liggett of The Vinyl Guys was on hand to talk about the SG-300’s capabilities from a user’s perspective and visitors could probe him on the day-to-day practicalities of running a print business using this technology. Now that Printwear and Promotion LIVE! is over for another year, it’s exciting to think of the creativity it has inspired among the visitors. This time next year, they could be taking their businesses to new heights using devices they’d seen for the first time at Roland’s stand. For those that missed the exhibition, the great news is that they can still see these machines and much more by visiting Roland’s Creative Centre just outside Bristol. If that’s a little out of your way, just get in touch with Roland and they’ll gladly put you in contact with your nearest dealer.